IT'S yet more sporting success for world number one golfer Rory McIlroy and Irish rugby coach Joe Schmidt. The country's sports stars lined out at the RTE Sports Awards at the Montrose studios last night when McIlroy and Schmidt were the big winners. After a stunning 2014, which included winning two Majors - the Open Championship at Royal Liverpool and the PGA Championship at Valhalla - as well as playing a leading role in Europe's Ryder Cup victory, McIlroy was named RTE Sport Person of the Year for the second time. 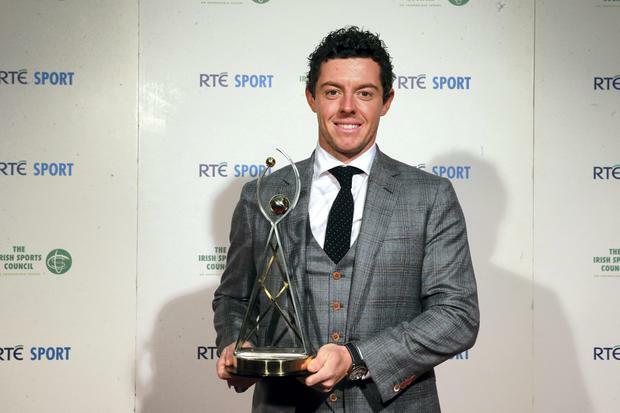 Rory was chosen as the winner by a panel of RTE sports journalists and editorial staff. Last weekend, he lost out on the BBC Sports Personality of the Year title to Formula One driver Lewis Hamilton. Irish rugby fans had a lot to thank Joe Schmidt for this year. Having started 2014 by guiding Ireland to Six Nations glory, Schmidt saw his side go on to end the season with wins over South Africa, Australia and Georgia in the November series, which saw the national team climb to third in the world. Due to that phenomenal achievement, Schmidt was named as Sports Manager of the Year. The top awards in sport are also about honouring the top players of the past, and one of Schmidt's former players was also in the spotlight. New dad Brian O'Driscoll was honoured with the RTE/Irish Sports Council Hall of Fame Award. It has been quite a year for the former centre as he welcomed his first son Billy into the world last month and won Sports Writer of the Year at the Irish Book Awards for his autobiography, The Test. He also became the most-capped player in rugby union history. The awards, held in association with the Irish Sports Council, were presented by RTE's Darragh Maloney.